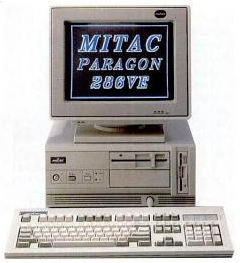 Before the original Atari PC4 was released to the market, Atari began selling the Mitac Paragon 286VE and re-branding them as the Atari PC4. Specifications wise they were comparable to the original Atari PC4 but that’s where the comparison ends. It appears this move towards Atari selling generic IBM PC clones, as opposed to the Atari designed and built PC’s, was the beginning of the end of the Atari PC line and a sign of things to come with the Atari ABC series in the early 1990’s.